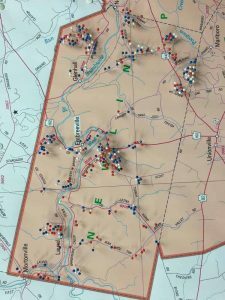 To make clear to the Newlin Board the broad extent of support for the anti-gerrymandering legislation, volunteers created a pin-board map showing who in Newlin had signed the petition and with what political party they were affiliated. Red represents Republican, blue Democrat, and white Other. NEWLIN – At its June 12th meeting, the Township Board of Supervisors will consider again a resolution seeking to end gerrymandering in Pennsylvania by supporting legislation calling for fair, independent, nonpartisan redistricting reform. The resolution also calls upon every elected official who represents the voters in Newlin Township to publicly support and work for passage of that legislation. Some are already on board. Gerrymandering is a practice intended to establish a political advantage for the party in power by manipulating electoral district boundaries. This will be the third month in a row that the Newlin Board of Supervisors considers the resolution. In April, the Board heard a presentation by Newlin residents Pamela Reischauer and Lucy Oblonsky. The board wanted to confirm township support for the resolution and to better understand the issue. In addition to resident support, Reischauer and Oblonsky will share with the Supervisors that Newlin’s PA State Representative is a strong supporter of redistricting reform. The Hon. Eric Roe is one of two primary sponsors of HB 722, the recently introduced bill that embodies the redistricting reform encouraged by the Newlin resolution. “HB 722 would hand redistricting powers to ‘We the People.’ It incorporates many of the founders’ trademarks, too: checks and balances, active civic participation, sustainability, transparency and fairness. As the Republican prime sponsor of this bill, I’d like to thank Democratic prime sponsor, Rep. Steve Samuelson, and FDPA for working with me,” says Roe. Fair Districts PA (FPDA), a not-for-profit, nonpartisan organization promoting fair redistricting reform (www.FairDistrictsPA.com) is leading the effort across the state. “We are asking every municipal governing body in Chester County to consider a resolution calling on its representatives in Harrisburg to enact fair, independent, nonpartisan redistricting reform this year,” says Kate Young, the group’s Chester County coordinator (kate.young@gmail.com). “Simply put: It’s wrong for legislators to pick and choose their voters when real democracy demands that the voters select their own representatives,” Young says.